For all you facing a dreary September of meaningless games, The Baseball Codes by Jason Turbow with Michael Duca will bring a little joy to your personal Mudvilles. Turbow and Duca classify the “unwritten rules” of baseball into four broad categories: On The Field, Retaliation, Cheating, and Teammates. Each section is full of entertaining anecdotes, but – perhaps inevitably – Retaliation and Cheating are the most fun. My favorite story involves the 1900 Philadelphia Phillies, who positioned a player with binoculars in the centerfield clubhouse to steal the catcher’s signs (no innovation) but used a vibrating electric box buried in the field beneath the third-base coaches’ foot to tip the signals via Morse code. Opposing teams were suspicious of the enormous difference between the Phillies’ home record (excellent) and their away record (awful). Reds shortstop Tommy Corcoran became really suspicious when he noticed the third-base coach standing in a puddle all game. Corcoran dug in the mud and found the cheat. The Phillies denied everything. 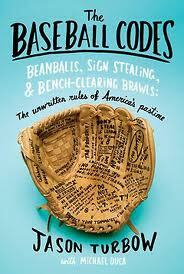 The Baseball Codes isn’t a comprehensive history, and it doesn’t offer an in-depth study of the game’s culture, but it is funny, lively, and an excellent source of stories to tell your friends over a beer while your favorite team is slouching away toward the off-season.